David Wilkins: What's a Nice Girl Like You Doing in a Place Like This? Apologies for my extended hiatus from this blog: I suddenly had a great deal of time-dependant work to do, which has kept me fully occupied for most of January. While I prepare for my next post, I hope there might be some interest to be had in another one of my old essays. In this short but somewhat steamy article I take a look at another one of the curiosities of the Roman world: the poetess Sulpicia, who remains the only extant female author of Roman love poetry. Offering a very different perspective from her male counterparts, Sulpicia's poems reveal a great deal about the purpose of Roman love poetry as the unexpected reversals she makes suggest that, as a genre, it was far less subversive than it might otherwise have appeared. Valuable to feminist historians, she allows the otherwise ephemeral and artificial image of the Roman woman to take solid form, albeit briefly, giving us a glance of love on the other side. An early example of my work as an undergraduate, this is too short, a bit rough around the edges and performs all sorts of mental gymnastics to incorporate the textual criticism necessary for assessment. Nevertheless, its conclusions are sound and, playing with the limits of what qualifies as "textual criticism", it demonstrates the mutual value of modern interdisciplinary research to the Classics. 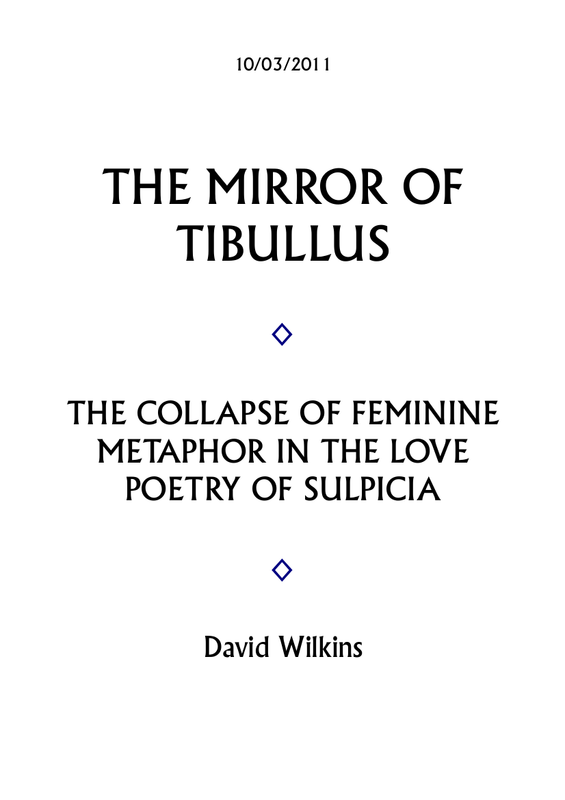 Attempting to utilise recent scientific studies, it makes an effort to certify the questionable authorship of the Sulpicia poems with reference to the measurable differences exhibited between modern male and female sexual fantasies, arguing that the poems are undoubtedly female in their sexual imagery. While perhaps doubtful in that respect, the end result is regardless an interesting read, casting new light on works formerly dismissed as either false or hopelessly naïve.